** UPDATE: The hospital won’t reopen until July, but voters approved the 1% sales tax initiative thereby preserving the hospital and keeping creditors whole for the time being. Crittenden Regional Hospital in West Memphis, AR is at risk of closing and at risk of defaulting on $6 million of unrated bonds. According to its most recent financial statements posted on EMMA, the hospital lost $2.7 million in 2012 and had negative net assets. More recently, hospital leadership approached county government in search of a cash infusion to continue operating. County officials have called a special election for June 24 at which voters will decide to impose a 1% sales tax hike for the next five years, with proceeds dedicated to the hospital. The sales tax initiative may face resistance because taxes in Crittenden County are already high. In West Memphis the combined rate is 9.75% while it’s 10.25% in the county seat of Marion. Worsening matters for the hospital is that it has had to temporarily shut down in the wake of a June 5 fire. It may not re-open before the special election – thereby giving voters a preview of what life may be like without the facility. Crittenden Regional is one of many smaller hospitals facing financial difficulties. Four rural hospitals in Georgia closed during 2013 and 2014, while North Carolina’s Vidant Pungo Hospital narrowly avoided an April 1 shutdown. The North Carolina facility is operating under a cash infusion from its non-profit parent group, while the city of Belhaven negotiates a takeover. Progressive media outlets have started to cover the string of rural hospital closures, depicting it as a consequence of Republican opposition to Medicaid expansion in red states. But the Medicaid expansion is only part of a more complex picture. Rural hospitals have been under pressure for many years. In the 1990s, 140 of these facilities closed. Congress responded by creating a Critical Access Hospital program to support this class of hospital in the 1997 Balanced Budget Act. More recently, these hospitals have been heavily impacted by limitations on Medicare reimbursement rates – including a 2% reduction imposed as part of the federal budget sequestration in 2013. Meanwhile, in California, Palm Drive Hospital closed in April, while Doctor’s Hospital in San Pablo faces closure after voters failed to approve a parcel tax measure intended to save it. California implemented the Medicaid expansion – but it was apparently not sufficient to save these two facilities. For bondholders, smaller hospitals provide both opportunities and risks. 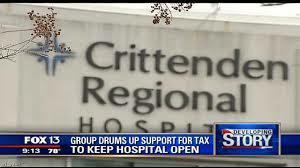 Crittenden Hospital bonds recently changed hands at a 6.42% yield – tax free. But because these smaller facilities fly under the radar screen of the major media and are often unrated, investments in their bonds can be difficult to monitor. This is where Bitvore can help. By scanning a large volume of media reports and then delivering relevant content by CUSIP, we can help you track smaller, high yielding issues. With Bitvore in your toolbox, you can reach for yield while maintaining piece of mind.